You can meet friends and watch the latest films. The staff can show you where your film is playing. At the UGC cinemas you can buy snacks like nachos, popcorn, drinks, chocolate and ice cream. There is also a bar on the second floor. If you like going to the cinema a lot you could buy a cinema card. This costs £9.99 a month and you can see as many films as you want at any UGC cinema. It can be quite expensive because you have to pay for 12 months (1 year). If you want to know more phone UGC on 0870 241 3445. These times may change depending on whats showing. If you want to book tickets phone 0906 681 6868. People with disabilities, supporters, senior citizens, unemployed people and students can have a concession price. To get a concession price you need to show some proof, like your Disability Living Allowance certificate. A soft drink and popcorn will cost about £6.00. A bottle of beer will cost about £3.00. The UGC cinema is behind the Docklands museum. There is pay and display parking. 277, D3 and D7 are the nearest fully accessible buses. (Jubilee line) - Canary Wharf underground station is about 625 metres from the cinema. Canary Wharf underground station is accessible for wheelchair users. The station has an accessible toilet. West India Quay station is about 240 metres from the cinema. West India Quay is fully accessible for wheelchair users. Limehouse and Canning Town are the nearest mainline stations - then change onto the DLR and get off at West India Quay station. The way through the entrance to the box office is flat. 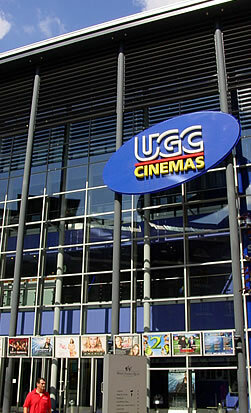 The UGC cinema has 4 main floors. Ground Floor Where you can find out what films are showing, meet friends and buy your tickets. There is some bench seating on the ground floor. Has a snack kiosk, accessible toilets (and baby change) and 5 screens. Has a bar and a comfortable place to sit. Has more accessible toilets (and baby change) and 5 screens. There is an escalator and lift to get to the other floors. The lift doorway is 795 mm wide. There are male and female accessible toilets on levels 1 and 3. They have hand rails. They are not locked. There are baby changes in the accessible toilets. The staff were really friendly and helpful on our visit. They have disability awareness training. All UGC cinemas have a wheelchair. You can ask at the box office for more information. There are infra red hearing loops or induction hearing loops at the UGC cinema. If you need to use the hearing loops it is a good idea to contact the cinema before you go and tell them what film you are coming to see. Click to find other UGC cinemas in the UK.